Wooden Intrepid Model Sailbaot Decoration 35"
The wood for the hull and the glass bottle should be chosen after the model is selected; the proportions of the ship are better suited to some bottles, and measurements of the ship parts are controlled by the inner diameter of the neck of the bottle. Usually, the wood is a hardwood such as spruce or fir, and it should be close-grained with no flaws. Bottles with flat sides rest on shelves or tables easily. Three-sided bottles with "dimples" also display attractively. Round bottles require stands or supports for stability. Ships with more than three masts look sleek in slender, elongated bottles. Sloops, schooners, and other ships with one or two masts fit shorter bottles well. 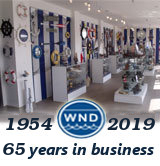 Other wood supplies include bamboo cocktail skewers or small-diameter dowels for spars, popsicle sticks that can be carved into deckhouses and lifeboats, wood matching the hull for a display stand, and larger blocks of scrap wood for a raised work stand. Sandpaper in grades from about 120-200 for smoothing the hull and other wood is also essential. Thread, wire, glue, and clear nail polish are used for the rigging, metal trim like rails, and gluing pieces together (the nail polish is also used as glue). Beeswax helps seal the fine wisps of thread together. Paint thinner, model enamels in a variety of colors, and fine paintbrushes are the materials and tools for painting the ship parts. Medium-weight white bond paper is cut into the shapes of the sails, and seams are drawn on with a pencil that is also used to curve the sails. The "sea" beneath the ship can be made with one of two materials. Linseed oil putty and artists' oil colors, especially white, shades of blue, and some green, are the materials for one method. In the second technique, Plasticene (artists') clay is used to shape the sea. The clay is manufactured in a wide range of colors, so the model builder can choose the best sea color or combination and use white clay slivers for whitecaps. 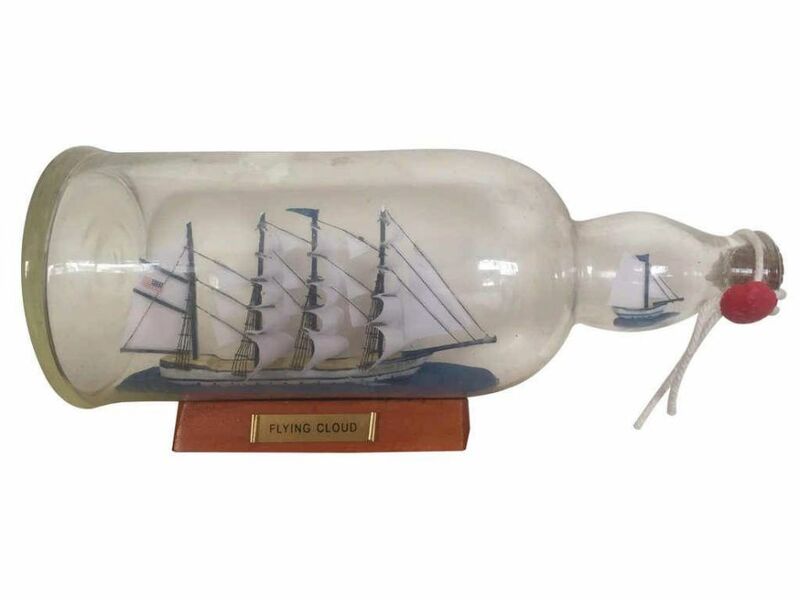 The method of sealing the bottle should also match the style of the ship and bottle, and the method dictates the materials. Corks, red sealing wax, and cotton fishing line tied around the neck of the bottle in Turk's Head or other sailors' knots are a common combination. Finally, the underside of the bottle (or back of a display board) should be inked with white enamel describing the model. The hobbyist also needs a selection of simple tools like Exacto knives, a hobby drill with fine bits, and miniature screwdrivers, saws, and a vise. Some tools have to be made for the specific bottle and model size. These include wire tweezers, scoops, and tampers for reaching the back of the bottle and for scooping and tamping putty or clay into place. Clothes hangers can be cut and shaped into long handles for these tools, and pieces cut from a tin can should be soldered to the wire to finish these.